Successfully Added Waterproof Tri Band Multimedia Touchscreen Cell Phone to your Shopping Cart. 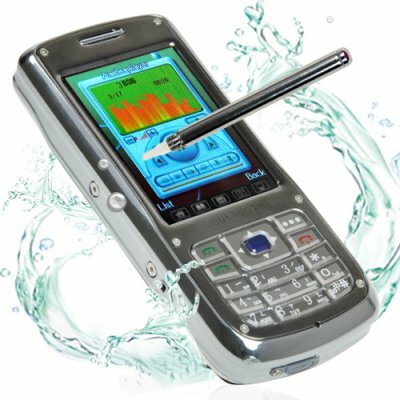 Three Band GSM (850MHz, 900MHz, 1800MHz) water proof touchscreen media phone with Dual-SIM card slots for worldwide use. Yes, your read that correctly, this cellphone is waterproof! A stainless steel housing, riveted on faceplate, and battery compartment with rubber seal and slide-channel battery cover completely protect this phone from any amount of water (including submersion). With this baby you'll never have to worry about water damage again. In addition to being waterproof, this Tri-Band worldphone will work anywhere and it's packed with multimedia features. The intuitive menu, touch screen and navigation pad make this phone a breeze to use. And you will love the camera, video recorder, software tools, and media players. Now you'll be able to make phone calls, watch movies and listen to music while out on the go, in the shower, or even underwater! Lets not forget that this is not only a fun digital media phone, but also a very useful business phone. With native tri-band GSM/GPRS to keep you connected all around the world, protection from the harshest of weather and environments, and dual SIM with dual standby allowing you to have two active phone numbers in the same phone, this phone is the traveling salesman or playboys ideal phone! The CVSED-A3809 waterproof mobilephone is packed with well designed features and is available right now at a great wholesale price with no M.O.Q. (no minimum order quantity), only from Chinavasion. Waterproof Tri Band Multimedia cellular phone with touch screen. Dual SIM card slots with dual standby. The package includes two long life batteries and everything else you need to take it on the road and start using right away. NOTE: This product is compatible with GSM at the three frequencies of 850MHz, 900MHz, 1800MHz. This can be used throughout most of the world. Works with some cellphone networks, check yours first.